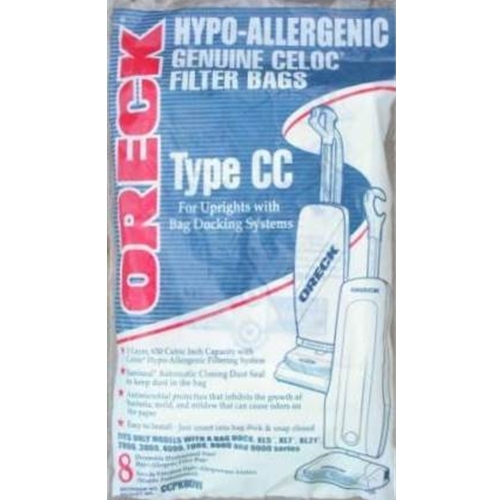 Genuine Oreck Celoc Filter Bags. 3 Layer, 630 Cubic Inch Capacity With Celoc Hypo-Allergenic Filtering System. Saniseal Automatic Closing Dust Seal to keep dust in the bag. Antimicrobial protection that inhibits the growth of bacteria, mold and mildew that can cause odors on the paper. Easy to install - Just insert into bag dock & Snap closed. Fits only models with a bag dock system XL7, XL21, 2000, 3000, 4000, 8000, and 9000 series.